Experts and entrepreneurs from the University of Toronto will have a heavy presence at this week’s Elevate Toronto technology “festival” – a new three-day event that showcases Toronto’s emerging status as a leading innovation hub. The festival, which kicks off Tuesday, features a series of conferences and social events at venues across the city on topics that range from health-care innovation to financial technology and virtual reality. One of the biggest draws is shaping up to be Wednesday’s MaRS Discovery District conference on artificial intelligence, or AI, a fast-growing field where U of T has emerged as a global research leader. 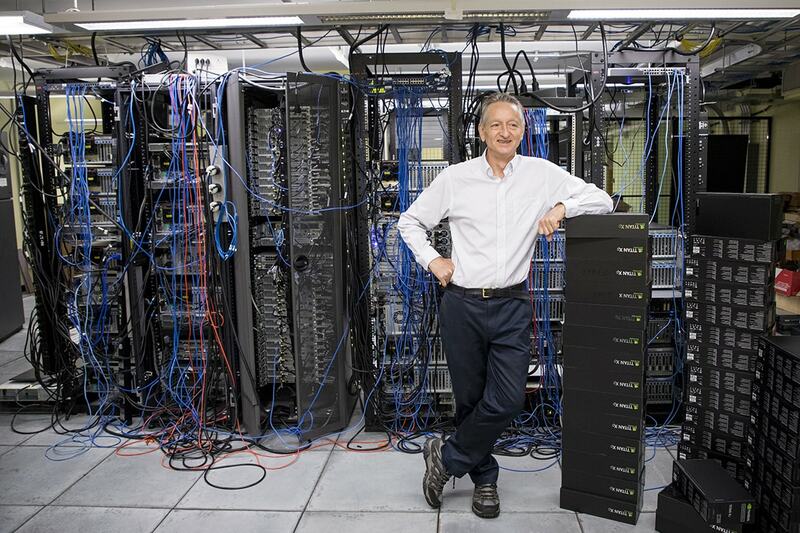 The AI event’s keynote address will be delivered by U of T University Professor Emeritus Geoffrey Hinton, a senior engineering fellow at Google who is known as the “godfather” of deep learning, a branch of AI that uses layers of algorithms to mimic the human brain. Hinton’s research helped spark an AI revolution in recent years as companies race to incorporate the technology into everything from new drug discovery tools to self-driving cars. One of those companies is ride-sharing giant Uber. Earlier this year, the Silicon Valley firm tapped U of T Associate Professor Raquel Urtasun, a star in the AI field of computer vision and machine perception, to head its new driverless car research lab in Toronto. Urtasun (pictured below) is scheduled to deliver a talk September 12 at the Sony Centre for the Performing Arts. “Elevate Toronto's keynote speakers and events showcase not only some of U of T's most outstanding innovators, but also sectors where we are leading the world,” said Derek Newton, U of T’s assistant vice-president of innovation, partnerships and entrepreneurship. Newton added the university is proud to play a key role in contributing to the city’s broader innovation ecosystem, citing U of T’s world-class research and researchers, as well as a broad, multidisciplinary entrepreneurship program comprising many hubs and accelerators. U of T has also been a founding partner of several leading innovation organizations, including MaRS Innovation, MaRS Discovery District, health incubator JLABS @ Toronto and the Centre for the Commercialization of Regenerative Medicine. Most recently, U of T partnered with the federal and provincial governments, as well as industry, to launch the Vector Institute for artificial intelligence research. “Toronto is poised to become one of the leading technology startup hubs in the world thanks to our world class research, talent, and collaborative community of entrepreneurship hubs and innovation partners,” Newton said. • Alexander Levy, a U of T alum who is co-founder and COO of Atomwise, a Silicon Valley based company that uses AI to help with drug discovery. The festival’s “work” conference, meanwhile, features an executive from Blue J Legal, a U of T startup co-founded by Professor Benjamin Alarie that uses AI to predict the outcome of tax law cases. Several of the other presenters at Elevate Toronto’s events are either U of T alumni or have ongoing connections to the university. Elevate Toronto was first announced earlier this year. Dubbed a “grassroots initiative,” the festival is a collaboration of technology organizations in partnership with the City of Toronto.